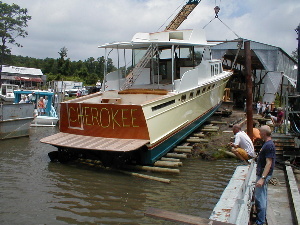 July 3, 2003 During a harrowing night of tropical thunderstorms and high winds, FishDoc and Blake went to check on the Cherokee. The power was out all over, and lightning revealed waves lapping over the grass in a perfect high tide for launching. Would it be this high 12 hours later at 1:00 pm? Of course not! 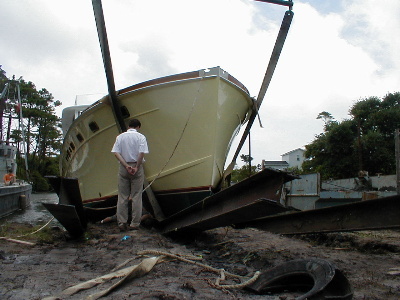 In the heat of day, it was only a “low high tide,” making Julian Brown wonder if the launch would happen after all. 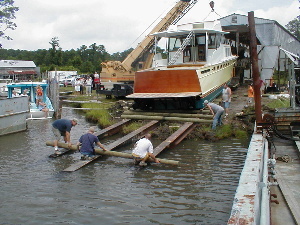 But time and launchings wait for no tide – the crew put the rollers on the I-beams, using clumps of mud to keep them from rolling off into the water. 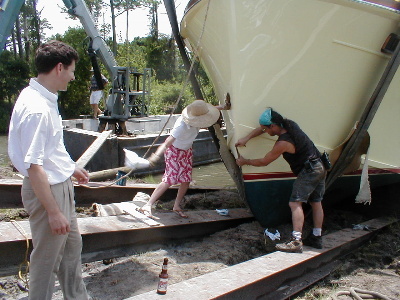 Jerry Davis slowly pushed the Huckins toward the edge, while George Brown helped keep her steady with the crane’s strap. Some of the logs made loud cracking sounds and broke, helping make the process all the more nerve-racking. 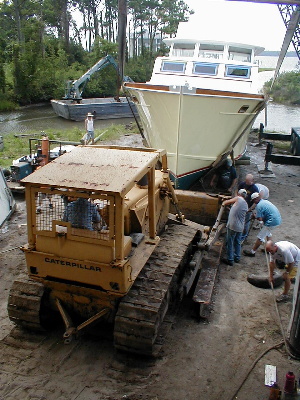 After months in the shed, we almost forgot just how huge that vessel was! Then at the end of the track, Jerry backed off and George and gravity did the rest. He lifted her bow so she’d tilt toward the water and Spa-lash! she launched herself as easy as falling off a log. 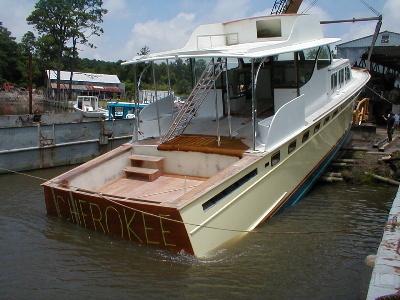 Always thinking of the important things, Bryan jumped upon the stern mid-launch to apply “Cherokee” in bright green painter’s tape while the crew adjusted rollers. 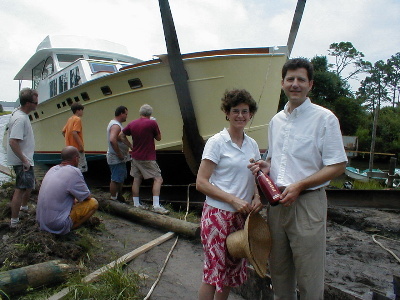 One could only guess what was going on in the minds of Tom and Jodie Darden, proud parents of a 65 foot baby. The crew, believing no alchohol should be wasted, suggested that Jodie open the bottle of champagne, sprinkle a symbolic amount on the bow, and pass the rest around. But Jodie took the traditional route and with one firm swing smashed it against the bow (protected by a crow bar so as to not make a dent) and christened Cherokee. 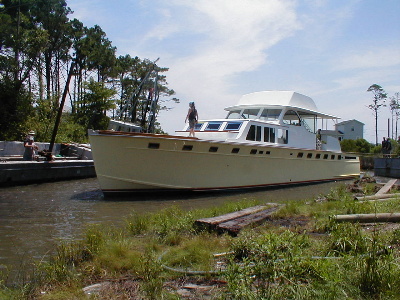 The Huckins was pulled over to her new moorings in the side creek, where she’ll stay while the crew finishes up her interior, flybridge, and decking (FishDoc will check up on their progress when she gets back from Peru in a month). Good thing she only draws about three feet! Then the cooker was fired up, the accordions unleashed, and an impromptu non-official launching party unfolded.